After keeping away from the area for almost 24 hours, the PSNI police were accused of engaging in collective punishment with a heavy-handed “evacuation” and gratuitous assaults on local residents. Sunday’s attack, which happened in the Creggan Heights, involved an “EFP” -- an explosively formed projectile, powered by Semtex explosive and fired by command wire. The device directly hit a PSNI vehicle and damaged one of the rear doors. Derry PSNI chief Steven Cargin said the device was “substantial and sophisticated”. In a comment on Twitter, Sinn Fein Deputy First Minister Martin McGuinness said it was a “futile act” which would “achieve nothing for those responsible”. It was the latest incident in an escalation of activity by the new IRA, which is currently strongest in the northwest. Two other attacks in Derry and Strabane over the past three weeks have used a pressure plate, trip wires and a command wire. A warning issued to civilians last week not to allow themselves by used as ‘proxies’ by the PSNI was also seen as significant. In a further statement this week, the same group warned people to stay away from Crown force targets. 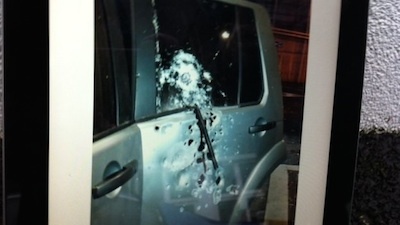 They statement read: “IRA volunteers struck a PSNI vehicle with an EFP mortar style device triggered by a command wire. The group said they remained committed to attacks against British state forces and their agents in Ireland. “Britain will continue to pay the price for her illegal occupation of the six counties and the continued denial of national self determination. The ‘new IRA’ statement also rejected Sinn Fein’s political condemnations, and criticised nationalist politicians who took part in Remembrance Day commemorations for British armed forces this weekend. The seriousness with which the Crown forces are taking the situation was displayed in a highly aggressive security operation in the Creggan on Monday night. The PSNI entered the area in armoured vehicles and immediately ordered an evacuation, using CS spray and direct physical violence. Chaos erupted after the PSNI attempted to clear residents from their homes and began arresting all those who resisted. One woman who was remonstrating with a member of the PSNI was seen to be punched violently by another, without warning. A mini riot broke out, and a small number petrol bombs were thrown by local youths. Independent councillor Gary Donnelly, a leading member of the 32 County Sovereignty Movement, said the trouble was a reaction to the PSNI handling of the situation. Mr Donnelly said that anger was “palpable” amongst residents when the PSNI moved in, an estimated 13 hours after the bomb attack. In a Facebook message, he said: “Palpable anger in Creggan tonight as locals are beaten, gassed and arrested by the RUC. Not a politician or community worker in sight. “Local man had his front door kicked off its hinges and arrested for refusing to leave his home. Local shop owner trailed out of his shop and forced to close, another resident assaulted and threatened with arrest for parking his car outside his home. Mr Donnelly said politicians and media had become “very one sided” and were ignoring the actions of the state. Mr Donnelly was also asked if he would condemn the mortar attack Sunday night. He said: “I am a Republican and I am critical of the state. There’s plenty of people out there who will condemn it. I won’t. “Condemnation won’t change anything. The SDLP are hypocrites, (Mark) Durkan praised the bravery of British troops in Afghanistan and Iraq, as do the Unionists.